Note: This project description first appeared as a post on Engaging Cities. A big part of engaging citizens includes understanding the needs and wants of a particular community; the other part is involves engaging people to take a deeper look at their built environment and public spaces. While both aspects of participation take time and commitment, the difficulty of the latter is compounded by a general vagueness in as to the manner of effective approach. For instance, a neighbor may say, “I want more green-space.” Agreed. But then, is the neighbor aware of all the green space assets already available? If so, how is this awareness to be measured? If not, how can interest be sparked? This is not to say that more green-space may not be welcome, or even necessary; rather, a robust articulation of the existing condition by both planners and the community users adds invaluable relevance to whatever new projects are created. In my own experience, the specific community itself may inspire the appropriate methods for engagement. In my work in Barcelona on Public Space and Participation with Raons Publiques, we traveled into one specific neighborhood several times each week to talk to residents and begin to know their past history, present needs and future desires. We also spent time getting to know many of the public spaces in the neighborhood. We developed a methodological observation of these spaces to formulate a set of qualitative and quantitative characteristics. Soon, however, our question became: How do we engage citizens to really participate in the future of their environment beyond merely the paper survey? I am concerned with “on the ground” involvement: depending on the geography or specific demographics of a community, resident participation cannot begin online. And, so while there is much to be developed in the area of face-to-face citizen participation, I have one working option to share. Watching school children play in the busiest plaza in the Fort Pienc neighborhood always made me wonder how the many other public spaces in the neighborhood could be so devoid of activity despite their propinquity. As they played, I also observed the children trade soccer cards, just as children all over the world trade the sports players important to them. During this time we had also launched the game of “Neighborhood Detective” where children could answer five questions about the space we were in by interviewing obliging adults; the kids liked the game, but we didn’t have any appropriate prizes with which to reward them, or any method to keep the game going beyond the initial five questions. 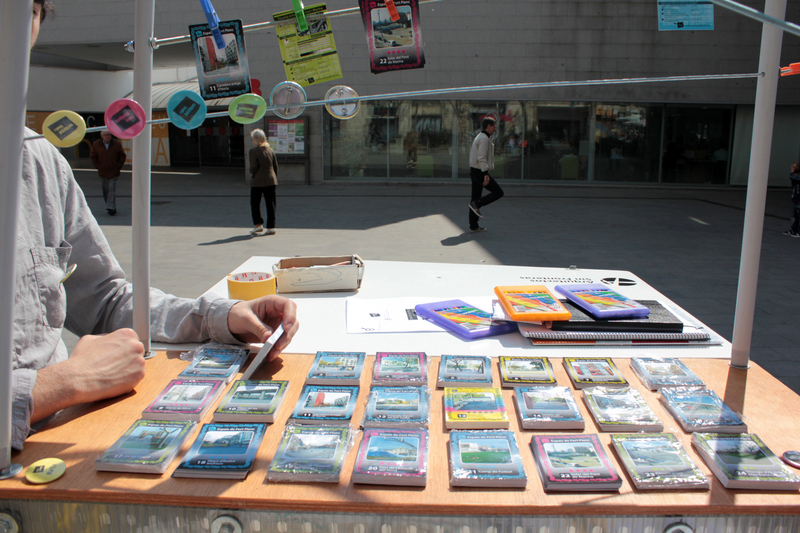 The combination of the Neighborhood Detective game and the on-site observations sparked the idea of Public Space Trading Cards as a means by which to engage kids to look more closely at their environment. 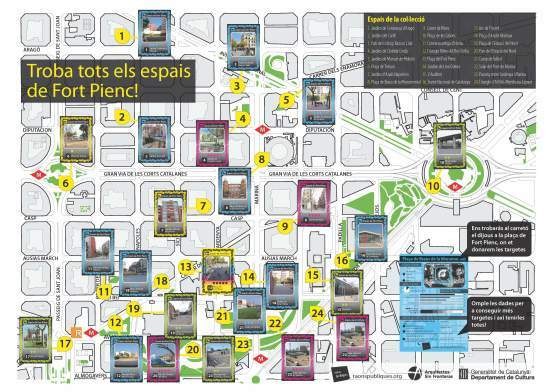 In a few weeks, we used the interdisciplinary members of Raons Publiques (architects, graphic designers, anthropologists and sociologists) to implement the Fort Pienc Public Space Trading Cards. 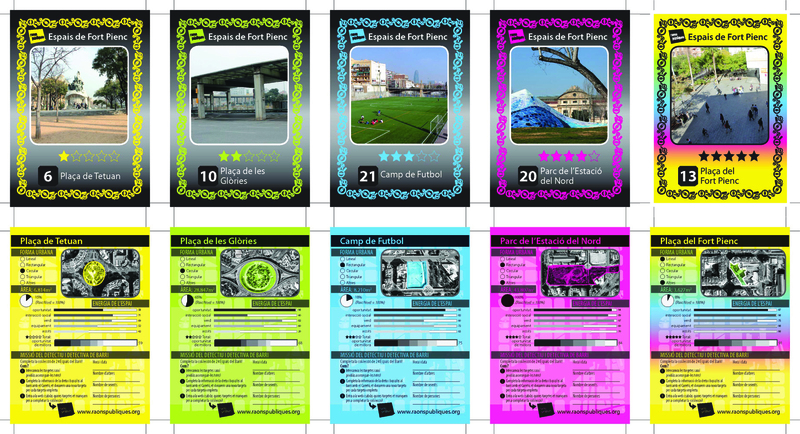 We introduced 5 categories of cards with corresponding colors, depending on the “Energia de L’espai” (Spatial Energy). We looked at opportunity for development, social interaction, vegetation cover, program (coffee shops or a library or stores) and accessibility to determine some objective characteristics of each space. Complete the collection of all 25 cards. How? 1. Exchange cards with fellow players until you collect them all! 2. Complete the questions on the back of the cards and you will receive the prize of a new card Questions: Number of trees; Number of benches; Number of people in each particular Public Space depicted on the card. 3. Go online for more information. Once a Neighborhood Detective (child or group) completes the questions on the back of the card, they get a new card as a prize. The new card is also a new mission, perpetuating the game until the Neighborhood Detective collects all 25. 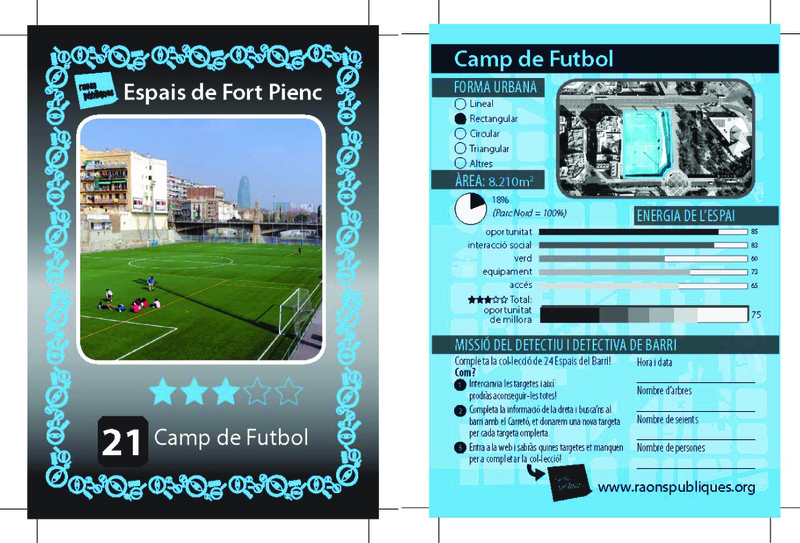 When we introduced the cards, printed and shiny in the similar format of the soccer cards that they recognize, the children instantly connected with the game. The participants also enjoy earning the cards by filling out the site-specific questions on the back. The game is in full swing, and the results cannot yet be fully appreciated. Perhaps the children will learn about a space in their neighborhood they hadn’t previously encountered. Perhaps now they will look at public spaces and the benches and trees within them just a little differently.